of applications. 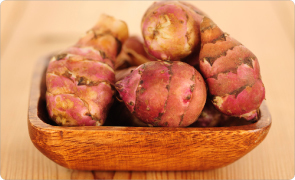 The Jerusalem artichoke contains the vital ingredient inulin, which is made up of a variable number of fructose units. The flowers, leaves and tubers of the plant can be used and its extraordinary health benefits are now widely known. The composition of the sugar moieties in the leaves and tubers can differ significantly depending on factors such as the harvest, storage, variety, water availability and fertilisation. Inulin is a carbohydrate that aids digestion, stimulates bowel movement and also lowers cholesterol levels in the body. Inulin is also a form of sweetener and can exhibit a high level of sweetness, providing the body with energy without affecting blood sugar levels. Allegedly discovered by French seafarers in North America and brought back to Europe at the beginning of the 17th Century. It has been cultivated in Germany since the mid 17th Century.